"Chickens' mental ability is akin to cats, dogs, and toddlers. A new video released by animal-activist group Mercy For Animals features chickens completing complex tasks such as identifying matching playing cards, remembering which cup out of four is covering a nugget of food, and understanding sequences of events. According to the video, chickens have a knack for remembering objects, can learn through observation, and seem to enjoy mental challenges. This video is strikingly similar to footage of cats, dogs, and human toddlers performing similar tasks. The purpose of releasing this content is to show people that species such as chickens are incredibly intelligent, and that there is no difference between animals many eat as food and those they consider companions." - VegNews. "If you torture a single chicken and are caught, you’re likely to be arrested. If you scald thousands of chickens alive, you’re an industrialist who will be lauded for your acumen." Know How That Chicken Got to Your Table? "Most egg-laying hens spend their lives crammed in spaces so tiny they cannot turn around or spread their wings. While chickens raised for food have more freedom, they face horrifying deaths on assembly lines. Still conscious, they're hung and shackled upside down, at times breaking wings or legs. They go through an electrified "stun" bath, but some scientists say the shock might not render them unconscious. A saw slits their throats at a clip of about two birds per second. And when things go wrong — a bird raises its head above the stun bath or jerks and evades the saw — they could end up scalded alive in a vat." "Craig Watts, a North Carolina contract farmer for Perdue, has been raising chickens for “Big Ag” since the early 1990s. He was even recognized as a top producer. But now, he’s pulling back the curtain on the entire industry by allowing reporters into his sheds to document the cruelty of industrial chicken production." "According to the industry itself, each hen in a battery cage is given less than 9 inches by 9 inches in which to live her entire life, crammed into a cage about the size of a file drawer with four or more other hens... Make no mistake about it: Battery cages torment animals. 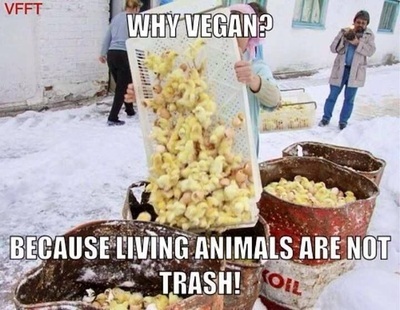 Physically, the animals’ muscles and bones waste away from lack of use, just as yours would if you were unable to move around for two years... Mentally, the birds, which can perform comparably to dogs on scientific animal behavior tests, go insane in these tiny cages. Imagine cramming five cats or dogs into tiny cages, hundreds of thousands in each shed, for their entire lives. That would warrant cruelty charges, of course. 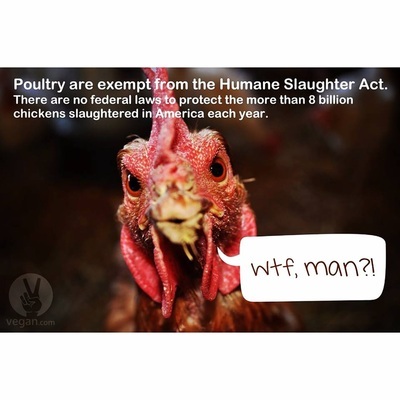 But when the egg industry does it to hens, it’s considered business as usual." "Chickens have mothers... These mothers are used to lay the eggs which are incubated and hatched into the chickens we eat. They suffer more than their offspring, but their welfare rarely gets the attention warranted by the grim lives we force upon them." "Organic, free range, barn or caged eggs, none have any commercial use for adult males. Millions are killed each year in the UK alone. 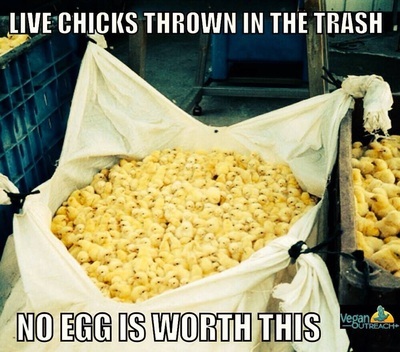 Stop this unimaginable waste of life - Please don't buy eggs."